Each zodiac is associated to one of the 12 mountains and will bring about a certain kind of elemental influence, thus has enhancing and curing capability. While the Four Celestial Guardians (Dragon, Phoenix, Tortoise and Tiger) guard the four cardinal directions, the Twelve Zodiac animals will relieve the 12 mountains (directions) off any disharmony caused by missing corners, disorganized elements and interactive influences among family members with certain directions. The twelve zodiacs also represent the cycle of time, therefore it will incorporate the "time dimension" to ensure long lasting good feng shui of a space, to create good luck, to cure bad luck and to increase desired opportunities in life. Ideally, for excellent feng shui, the surrounding without any missing corner or affliction are the most important factors to be considered before looking into the flying star system. If there is a slight imbalance, the feng shui can never be good no matter how good the flying stars are in our chart. To cure such problems, one can display the twelve zodiac animals. 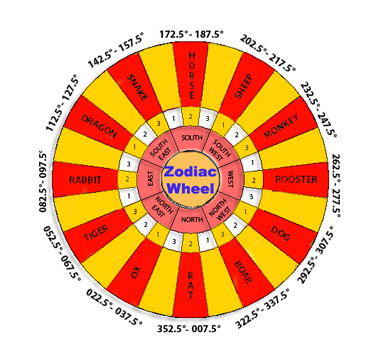 The chinese astrology studies have shown the corresponding directions of the zodiacs, shown in the astrological wheel below. 1. They can be clustered together on your side coffee table or your centerpiece by displaying them in a circular mode, each facing its own direction. 2. They can be separated into different corners of the house individually, each one must be displayed in the corresponding location.